BATHINDA, July 24  The Punjab Chief Minister, Mr Parkash Singh Badal, said the state government was monitoring the functioning of the police for checking police excesses. CHANDIGARH, July 24  The president of the Punjab Pradesh Congress Committee, Capt Amarinder Singh, has taken up this issue with senior leaders of his party high command and presidents of Pradesh Congress Committees to garner their support. CHANDIGARH, July 24  Though as per the law and procedure, these reports form the basis for discussion between the legislature and the executive, yet presentation of audit reports have become a mere formality. LUDHIANA, July 24  The Punjah Government has decided to honour all panchayats which strive to resolve village disputes through mutual understanding at their own level. KAPURTHALA, July 24  The district authorities today launched a special drive against encroachments on roads and footpaths to regulate traffic in order to implement the directions of the Punjab and Haryana High Court. BATHINDA, July 24  The CPI and CPM today held a joint rally in protest against the recent hike in bus fares and power tariff, the increase in the octroi and rising atrocities against Dalits and women. Addressing a press conference here today, he said the functioning of the police was being screened on a daily basis and suitable action was being taken against the guilty police officials involved in crime of any kind. He, however, ruled out the general screening of police forces. The Chief Minister said there were bad elements in the police which were committing excesses on the people and added the state government was dealing with such men strictly. When asked whether the state government was taking any steps towards controlling custodial deaths which were on the rise, Mr Badal said whenever a custodial death had been reported a case had been registered against the guilty police officials. He said the state government would not spare any policeman involved in any type of excess. Mr Badal said a "total employment scheme" for rural youth was being launched in Punjab. He said the Prime Minister, Mr Atal Behari Vajpayee, would inaugurate the scheme on November 1, 1998, at Kaljharani village in this district. He said the blueprint of the scheme was being prepared and it would be ready within 15 days. He said under this scheme the youth of rural areas would be given all facilities to set up their own vocations. After watching the results of this scheme in Kaljharani village other villages in the state too would be brought under this scheme. On the Udham Singh Nagar issue, Mr Badal said the Political Affairs Committee (PAC) of the party would decide about the course to be adopted if the central government brought a Bill for creating Uttaranchal state in Parliament for voting. Mr Badal denied any differences between SAD and the BJP over the recent hike in power tariff. He said the statement of Mr Daya Singh Sodhi, president of the state unit of the BJP, that his party was not taken into confidence by the state government while hiking the tariff on electricity by 33 per cent was surprising. He said the state government would welcome any suggestion on the recent power hike and if any trade organisation had any objection to it then the government was ready to hold talks with that organisation. Earlier, addressing the gathering at a function organised in connection with the administration of oath of secrecy and office to the newly elected sarpanches and panches of this district, Mr Badal advocated more rights for gram panchayats, panchayat samitis and zila parishads. He said the state government would give more powers to the gram panchayats for carrying out various development work in the village to bridge the gap between rural and urban areas. He said officers in every district of the state had been directed to give due respect to the panchayats and sort out their problems on a priority basis. He said democracy could not be strengthened unless the gram panchayats were strengthened. Expressing concern over the lack of basic amenities in the rural areas, the Chief Minister said the state government and people should work together to overcome such problems. He said the panchayats should keep a close watch on the development works going on in their villages so that the misuse of money could be stopped. He alleged in the past 50 years the successive Congress governments of the state had destroyed the institution of panchayati system in Punjab and it had led to economic imbalances, backwardness, unemployment, poverty and illiteracy. Exhorting the sarpanches and panchayat members to shed the policy of confrontation in the villages, the Chief Minister said panchayat members should work collectively, irrespecitve of their political affiliations and by burying all differences. He pointed out panchayat members should motivate the youth to set up their own units of dairy farming, poultry and small industries so that stress on the agricultural land could be reduced. Mr Nirmal Singh Kahlon, Mr Tota Singh, Mr Balramji Dass Tandon, Mr Sikander Singh Malooka, Mr Chiranji Lal Garg (all ministers), Mr Balwinder Singh Bhunder and Mr Chitan Singh Samao (MPs) and Mr Makhan Singh, MLA, were present. As many as 303 sarpanches, including 105 women sarpanches and at least 2,300 panchayat members, including more than 600 women panchayat members were sworn in today at the oath ceremony held at the local sports stadium. CHANDIGARH, July 24  The president of the Punjab Pradesh Congress Committee, Capt Amarinder Singh, who wants Udham Singh Nagar district to be retained in Uttar Pradesh has taken up this issue with senior leaders of his party high command and presidents of Pradesh Congress Committees to garner their support. Capt Amarinder Singh told TNS here today that he had taken up this issue with Mr Bhupinder Singh Hooda, president of the Haryana Pradesh Congress Committee and Mr Salman Khursheed, president of the Uttar Pradesh Congress Committee. Capt Amarinder Singh said Mr Hooda was concerned as a large number of Haryana farmers had settled in Udham Singh Nagar district and they too would be affected if the district was included in the proposed state of Uttaranchal. The Punjab Congress chief said that according to his information about two lakh farmers from Haryana had settled in Udham Singh Nagar district. He was hopeful that Mr Hooda would support him when the party high command finalised its stand with regard to Udham Singh Nagar district. Capt Amarinder Singh said that likewise the president of the Uttar Pradesh Congress Committee had already stated that opinion and views of the residents of Udham Singh Nagar district should be given due weightage before taking any decision with regard to the transfer of that district to the proposed new state of Uttaranchal. Capt Amarinder Singh said that he was certain that Mr Khursheed would support his stance on this issue. He said that he was also trying to contact the president of the West Bengal Pradesh Congress Committee to know his views on this issue. As a large number of Bengalis were settled in Udham Singh Nagar district, the West Bengal Pradesh Congress was bound to take up their cause, Capt Amarinder Singh said. When asked whether he had met Mrs Sonia Gandhi, president of the AICC, Capt Amarinder Singh said that as he was down with viral fever for the past seven days in Delhi he could not meet her. "I will meet her within the next two days" to discuss the issue of Udham Singh Nagar and other matters pertaining to the Punjab unit of the party, he added. Capt Amarinder Singh said a number of delegations from Udham Singh Nagar district had met him in Delhi. They were against the inclusion of the district in the new state. He said that in case Udham Singh Nagar district was included in the new state, sugar industry and rice shellers would be severely affected. Sugar mills and rice shellers get their raw material from certain districts of western UP which would remain in Uttar Pradesh. When asked whether the Congress high command would support him on this issue, Capt Amarinder Singh said that when presidents of four state units of the party  UP, Punjab, Haryana and West Bengal  take a joint stand, it would not be easy for the party high command to ignore them. He was confidant that the party high command would support the stand taken by the Punjab Pradesh Congress Committee with regard to Udham Singh Nagar district. CHANDIGARH, July 24  Presentation of audit reports to the legislatures has become an annual ritual, a mere formality. As per the law and procedure, these reports form the basis for discussion between the legislature and the executive so that accountability can be fixed. It, however, seems, making a provision is easier than implementing it. A case in point is Punjab. An analysis of the 1996-97 audit report of the Comptroller and Auditor-General shows that the discussion between the legislature  the Public Accounts Committee (PAC) and the Committee on Public Undertakings (COPU)  and the executive is awaited for over a decade. There are over 600 pending cases (audit paragraphs) relating to the period 1986-87 to 1995-96 waiting discussion. Replies to another 105 paragraphs, containing recommendations of the PAC and COPU, were awaited from the administrative departments concerned. These are to be given in six months. But replies are not submitted for over 10 years. The legislature should give a second look to the past cases and set a healthy trend for the future. The Auditor-General, Punjab, Mr Balvinder Singh, told TNS that since 1990-91 there has been "excess expenditure" over grants and appropriations as presented in various Budgets. This amount exceeds Rs 1,650 crore. It is yet to be regularised by the Finance Department. "It is shocking this has persisted so long without intervention from the legislature", he added. In Punjab, while the PAC is headed by Mr Jagir Singh, Akali MLA, the COPU is headed by Mr Satpal Gossain, BJP MLA. There has to be a strong "political will" to ensure financial discipline coupled with accountability. But for fear of audit, financial irregularities would have multiplied further. Audit focuses on four basic issues: salaries, purchase of material, hired services and transfer payments. Against every Rs 100 spent by the executive, authorised by the legislature, 50 per cent goes into salaries, 25 per cent into purchase of material, 10 per cent into hired services and 15 per cent into transfer payments. "The grey area", says Mr Balvinder Singh, "is the salaries: it is also the 'service' area. Though salary is committed, service seems optional given the attitude of the employees." This was so because "governance" was sans "performance indicators". There is no fear of action being taken because the legislature  the PAC and the COPU  is wanting in enforcing accountability. The Auditor-General said none of the three universities in the state at Amritsar, Ludhiana and Patiala, has ever prepared "balance sheet" ever since their inception, though, year after year crores of rupees have been given as grants by the government. 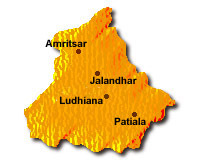 There are eight to 10 such organisations which are "outside" the ambit of the AG, Punjab. These include the Punjab Mandi Board, the Punjab Urban Planning and Development Authority(PUDA), the Punjab Health Systems Corporation and the Punjab School Education Board. Their audit done is by chartered accountants, who get paid handsomely. Mr Balvinder Singh has raised this issue with the government, seeking amendment in rules. He says a state government borrows loans on the security of the consolidated funds. The state legislature should put a ceiling on the amount to be borrowed. A similar ceiling can be imposed on guarantees given by the state for loans being raised by public undertakings. This will ensure check by legislature every time a revision is sought because these have piled up losses running into crores. Mr Balvinder Singh said in some states after approval of the Budget by the legislature, 50 per cent of provision for Budget and grants is kept at the disposal of the executive for six months. The balance is released only after the accounts of previous years are submitted. Why not try the same in Punjab? It will build accountability of the executive to the legislature. LUDHIANA, July 24  The Punjab Government has decided to honour all panchayats which strive to resolve village disputes through mutual understanding at their own level. If no case is registered from the village at a police station, the panchayat will be honoured at a special function and a grant of Rs 5 lakh will be given for the development of the village. The SHO's of all police stations have been asked to send monthly reports regarding FIRs relating to disputes in the villages. This announcement was made by Capt Kanwaljit Singh, Punjab Finance Minister, while addressing sarpanches and panches at a special function in Guru Nanak Stadium here today. After administering them the oath of office. The Finance Minister told the panchayats their first and foremost duty was to ease tensions and remove the bitterness which might have been created during the recent elections in their villages. They should try to strengthen brotherhood in the villages. Capt Kanwaljit Singh while congratulating the newly elected sarpanches and panches exhorted them to strive to come up to the expectations of the people of the village and strictly ensure proper utilisation of grants for development projects. The Finance Minister giving details of government's development programmes said the state government in the Budget for the current financial year provided a huge amount of Rs 2,500 crore for rural and urban development which was Rs 400 crore more than the previous year's Rs 2,100 crore. The minister disclosed the state government had prepared three new special schemes for rural development, including constructing building for primary schools and providing furniture, matching grants for development projects and encouraging NRIs to construct buildings of development projects which would be named after their dear ones. He said for the construction of school buildings village-level committees based on sarpanches, headmasters, representatives of the PTA and the public would utilise the funds and in case of an NRI adopting a project the government would contribute 30 per cent of the funds. Referring to the commitment of the government to strictly check the leakage of funds, the minister called upon the panchayats to immediately report to the ADC (D) in case any such instance came to their notice. Stern action would be taken against the guilty officers without delay. The minister also disclosed that in Ludhiana district funds amounting to Rs 65 lakh had been provided for distribution by MLAs for the purchase of sports equipment by sports clubs organising tournaments in the villages. Mr Arun Goel, Deputy Commissioner, Ludhiana, said the panchayats would be given due respect in government offices and police stations and asked them to provide justice to the people irrespective of groupism. He called upon the panchayats to keep vigilance on the utilisation of all government funds in their villages. Among others who addressed the function were Mr Amrik Singh Aliwal, MP, Mr Surjan Singh Thekedar, senior vice-president, SAD, Mr Jagdish Singh Garcha, Mr Bhag Singh Malha, Mr Bikramjit Singh Khalsa, Mr Sadhu Singh Ghudani, Mr Bachan Singh Cheema (all MLAs) and Mrs Arvinder Kaur Grewal, general secretary of the women's wing of SAD. Later, the Finance Minister presiding over the meeting of the District Planning and Development Board directed all officers to provide complete information to the MLAs regarding the development project in constituencies. He said the allocation of funds for the district development and planning boards would be made available at the earliest. Capt Kanwaljit Singh also presided over the monthly meeting of t he district grievances committee. On the complaint of Mr Sat Pal Gosain, MLA, regarding extra charging of Rs 2,530 for each gas connection by a gas agency of Samrala, he directed the SDM and the DSP to immediately register a case getting affidavits from the affected customers. At the meeting, 13 complaints were taken up and out of these seven were disposed of. The minister also directed the Commissioner, Municipal Corporation, to submit details of utilisation of the funds received from the district Development and Planning Board during the past three years. Deputy Commissioner, Usha Sharma, SSP Iqbal Singh, DSP, (Detective), Parambir Singh Parmar, DSP (City), S.S. Mand, Duty Magistrate, Rachpal Chand Sharma along with officials of the Municipal Council and Public Works Department supervised the anti-encroachment drive in which encroachments in the bazars were removed. Shopkeepers of Red Cross Market protested against this drive when some employees of the Municipal Council allegedly took away bundles of clothes from some of the shops. The agitated shopkeepers immediately shut down their establishments and sat on dharna at Court Chowk and also blocked traffic for about half-an-hour. The police dispersed the agitated shopkeepers and the dharna was lifted. Mr Bhupinder Singh Walia, president of the local Beopar Mandal, alleged that the police misbehaved with the agitated shopkeepers and the Municipal staff forcibly took away valuable articles from inside the shops in Red Cross Market. He further alleged rehriwalas were also not spared and the employees freely looted their fruits and vegetables. The irate shopkeepers again staged a dharna. The Deputy Commissioner told mediapersons that the traffic police had challaned more than 500 persons for not wearing helmets and black filming of vehicles during this week. She said two special teams had been constituted for the removal of encroachments on the roads. Addressing the rally, CPI state secretary, Mr Joginder Dyal, alleged that the state government had failed on all fronts. Mr Mangat Ram Pasla, former state secretary of CPM, while addressing the gathering alleged that SAD-BJP government in state had virtually murdered the democracy in the recently held gram panchayat elections. Nomination papers of the candidates belonging to other political parties had been rejected on flimsy grounds. He alleged that SAD-BJP government had also backtracked from all its promises made in their respective election manifestos. Mr Hardev Arshi, leader of the CPI group in the Punjab Vidhan Sabha, while addressing the gathering alleged that police excesses in the state were on the rise. Women were being raped and stripped in police stations. Innocent people were being murdered. All this was being done by those who had an "umbrella of protection" of the state government. He alleged that an illegal nexus had developed among criminals, politicians and bureaucrats and this nexus was ruling the state. Corruption had broken all previous records of 50 years. A resolution demanding the absolute handing over the holding of panchayat samiti and zila parishad elections to the state Election Commission was passed. In the second resolution, the CPI and the CPM demanded the withdrawal of 33 per cent hike in electricity tariff and 44 per cent hike in bus fares immediately. Earlier, party workers jammed traffic for two hours in front of the bus stand. They also tried to gherao the Chief Minister, who was here in connection with a function, but could not succeed. PATIALA, July 24  After jacking up the fees of private students and for undergraduate courses last year, Punjabi University has now effected an increase in fees for postgraduate classes.The hike is in the fee structure for regular students and hostlers taking admission in the university courses. Besides a number of new chargeable components have been added in the fee structure for the academic session 1998-99. The increase has already been approved by the Syndicate. All students will have to pay additional fee for the new components which are Rs 100 as infrastructure development charges, Rs 600 as seminar fee, Rs 300 for educational tours and Rs 300 as payment for the guest visiting faculty. All these would be charged at the time of admission. Higher education thus will become costlier by at least Rs 1300 for each student. Students taking admission in certificate diploma course in modern, classical and foreign languages will have to pay additional monthly charges of Rs 25 per month as maintenance fee, Rs 30 for electricity consumption and another Rs 30 for breakage fee. If studying in university does not seem enough then staying in hostels under the revised fee structure would definitely put the common man's financial abilities to test. Under the annual category, the admission fee has been increased to Rs 75 from last year's Rs 50. The medical fee has also doubled from Rs 10 to Rs 20. Development fund has gone up to Rs 50 from the Rs 25 charged previously. It would be the increase in monthly charges that will pinch the hostler more than anything else. The room rent has gone up to Rs 50 while earlier it was Rs 35. Water supply charges will cost Rs 20. Last year, they were Rs 10. Electricity will also cost Rs 10 more and establishment charges each will cost Rs 10 more. The dilapidation fund has an increase of Rs 15, similar to that of the student amenities fund. After calculation, it is found a hostler will have to pay nearly Rs 1,000 more than last year. Thus, a new student who has to take hostel accommodation would pay almost Rs 2300 more in comparison to last year. Dr B.S. Bhatia, Dean, Academic Affairs, when contacted said the increases were only marginal. They had become necessary as Guru Nanak Dev University too had increased its fee. The state universities had reached at an understanding of having fee parity and a uniform syllabus as decided at a meeting of Vice-Chancellors and Deans of the three state universities recently. However, Guru Nanak Dev University authorities citing financial crunch had increased certain components of their fee structure and Punjabi University too had to bring in the increases. However, Dr Bhatia maintained that the hike was very less in comparison to that of Guru Nanak Dev University, Amritsar. Another reason put forward for the hike for the second successive year by the Finance Department officials was that the higher education was a neglected sphere nowadays. The government had been pressurising the universities to arrange for their expenses themselves. Further, the increase in electricity tariff and increase in prices of all commodities had deemed the fee hike necessary, a university official said. CHANDIGARH, July 24  Capt Amarinder Singh, President, Punjab Pradesh Congress Committee, today announced that the Congress would launch an agitation in the state from August 7 by organising dharnas at all district headquarters to highlight the various issues like hike in bus fares and power tariff. The agitation, he said, would continue until the hike in bus fares and power tariff was withdrawn or "rationalised". The dharnas would be followed by other agitational programmes. A five-member committee of senior party leaders would be constituted within a day or so to chalk out the agitational programmes. Former Presidents of the PPCC and the leader of the CLP would be its members, he added. The decision to launch the agitation was taken at a meeting of senior leaders of the party here. The meeting was called to discuss various issues pertaining to the state and to mobilise support for the rally which is being organised at Delhi on August 28 by the All-India Congress Committee. As it would be a first rally to be held against the BJP-led government at the Centre, the Congress party was going all out to make it a grand success. Capt Amarinder Singh said that nearly 40,000 party activists from Punjab would participate in the rally which would be addressed among others by Mrs Sonia Gandhi. A quota for all districts had been fixed, he disclosed. Lashing out at the SAD-BJP Government in Punjab, Capt Amarinder Singh said that the power tariff hike would cripple the economy of the state. Already, the state's industry was facing recession. He said the government led by Mr Parkash Singh Badal had created a "mess" on the economic front in the state. Capt Amarinder Singh said that resentment among people against the Punjab Government was widespread. Refuting the charge that the Congress was against giving free power to the agriculture sector, Capt Amarinder Singh said his party would have first thought about alternative sources of revenue to finance the PSEB before taking any decision of giving free power to the farming sector. He said on the one side the Punjab Government was giving free power to farmers and on the other side the tariff had been hiked to financially "crush" people in the state. He said that Mr Badal had not taken the BJP into confidence before announcing the hike in power tariff. He said that there was no logic in what Mr Badal was saying about the hike in bus fares. "Bus fares have been only increased to please the rich Akali bus operators", he alleged. PATIALA, July 24  Even as the government is thinking of reconsidering the recent stiff hike in power tariff, the Punjab State Electricity Board Engineers Association has warned that any roll-back would push the board towards bankruptcy. The association feels that though the present tariff hike would earn the board Rs 600 crore during 1998-99, it would still leave a deficit of Rs 400 crore. This, they say, is a clear violation of the statutory requirement of minimum 3 per cent rate of return as per the Electricity (Supply) Act, 1948. To achieve this rate of return a further hike of 15 per cent is required and even a small roll-back of 6 to 7 per cent would result in a loss of more than Rs 200 crore annually, it feels. Association president Padamjit Singh and general secretary H.S. Bedi said this time also the association felt the industrial lobby might be successful in getting the power tariff lowered leaving domestic and commercial consumers to bear the brunt. They said the load factor was maximum in case of the industrial sector and any attempt to roll-back the tariff for the sector would spell doom for the board. The association, however, also expressed its deep concern at the failure of the government to compensate the PSEB in cash for the loss of revenue on account of free power to the agriculture sector. The cash loss on this account was Rs 275 crore per annum approximately. The government had assured the board of giving compensation in case at the time of making power supply free to the agriculture sector. But no efforts had been made on this front so far, they said. Whereas an annual inflation of the order of 8 to 10 per cent affected all sectors of economy, it was only in Punjab that there was an undesired freeze in tariff for the past two years. This proposed tariff of Rs 3.15 per unit for large supply consumers in Punjab was less than Rs 3.92 per unit prevailing in Haryana, Rs 4.14 per unit in Uttar Pradesh and Rs 3.42 per unit in Delhi, whereas the quality and reliability of power in Punjab was the "best" among northern states. They said since the energy demand of the state was increasing by 8 to 10 per cent every year, funds were required to set up new projects to meet future energy requirements. Unless the PSEB raised internal resources, it would not be able to meet future power requirements resulting in long power cuts, which would cripple the industry. Credit rating of the PSEB was so low that the marker borrowing was also not possible as was evident from the failure of present bond issue of the PSEB. Mr Padamjit Singh and Mr Bedi said the financial bankruptcy facing the PSEB had probably not been realised by the lobbies now opposing the tariff hike. In Andhra Pradesh, the electricity board had been split and was going to be privatised precisely because of accumulated losses. In a similar example of Orissa, its board was split up and repeated tariff hikes until now had not been able to solve the problem. Because of this, by all-round efforts in the fields of tariff revision, removing subsidy, checking thefts and reduction of losses were necessary to save the board from bankruptcy. CHHEHARTA, Amritsar, July 24  Teachers and students of various schools today gheraoed the police station here and resorted to traffic blockade on the GT road in protest against the alleged assault on Mr Dalip Singh Sandhu, Principal of the local Government Senior Secondary School by activists of a students union. The students and teachers, who observed a strike in various schools of the district, were demanding strict action against the activists of the students union. They alleged that the activists were rounded up by the Chheharta police and then let off without any action against them. The Principal alleged that activists of the Akhil Bhartiya Vidyarthi Parishad (ABVP) entered the school premises without his permission and started enrolment process. The school management further alleged that the activists of the student union compelled teachers of the plus one and two classes to leave the classes for facilitating the enrolment. The student activists also allegedly misbehaved with lecturers. However, a press note of the ABVP alleged that their activists were beaten up at the behest of the Principal and staff members. The press note further alleged that the student activists were beaten under a "deep rooted conspiracy". As per the report of the school staff, student activists made forceful entry into classrooms and when the principal tried to intervene, they allegedly assaulted him. The principal sustained minor injuries in the scuffle. The activists also reportedly assaulted other members of the staff. The Chheharta police rounded up four members of the ABVP, while the fifth one is at large. The staff members have decided to go on an indefinite strike till the fifth activist, involved in the scuffle, in also arrested. Representatives of teacher unions and students union (other than the ABVP) have threatened to give a call of strike in other schools and colleges of the district if all alleged culprits are not arrested by the police. Mr Balbir Singh Jhamke, general secretary, Government School Teachers Union, Mr Amarjit Singh Bhalla, president, Democratic Teachers Front, Punjab, Mr Ajit Singh Virk, general secretary, Government Senior Secondary Language Teachers Union, Punjab, Mr Datar Singh, president DTF Punjab, have strongly condemned the attack on the Principal and staff members of the school. Meanwhile, a 24-member joint action committee has been formed by staff members and student unions to persue the case. PATIALA, July 24  More than 10,000 employees of about 500 Punjab government-aided schools are up in arms against the state government over the non-payment of their salaries for the past three months. Mr Bhupinder Singh Chawla, president of the local unit of the Punjab State-Aided School Teachers and Other Employees Union, said earlier the government had not cleared the grant for the payment of salaries of employees in these schools. But now though some funds had been released, the grant had not been released to the schools, he alleged. An Education Department official confirmed the non-payment of salaries in the aided-schools and admitted that salaries had been withheld due to shortage of funds. The District Education Officer, Mr Kharak Singh, said the problem was being resolved. The government had released salaries of the employees of these schools in Ropar and Mansa districts. JALANDHAR, July 24  After acquiring 10 acres of land in 1966, the improvement trust here has yet to take possession of the site, while land mafia with the alleged help of the municipal corporation has gone ahead and constructed buildings on government property worth nearly Rs 10 crore. The land in question was acquired in 1966 by the improvement trust under a "plan scheme" and compensation was paid to the land-owners along with the tenants of a few shops, built on the railway road when the trust took possession of the land. The shopkeepers requested that they should be granted two days to move out. They moved high court and got a temporary stay. The trust was also directed to relocate the shops to a suitable place. But the improvement trust never took a decision to relocate the shops. The Deputy Director, Mr Chander Gandh, when contacted by TNS, admitted that no decision had been taken in the past 32 years by the trust to relocate the shopkeepers and that the trust still had not taken possession of the land. However, he said a notice had been issued to the municipal corporation to stop the illegal construction on the 10-acre plot. While the Joint Commissioner, Ms Sharda Gautam, along with the Superintendent of the municipal corporation, said a notice had been issued for the demolition of the constructed buildings, a compromise plan is reportedly being drawn. A shopkeeper Mr Rajesh Arora said Jalandhar was becoming notorious for illegal construction. The municipal corporation seems to allow the construction work and then lay down a fine and later a compromise is drawn, he added. BATHINDA, July 24  Members of the PSEB Engineers Association posted at Guru Hargobind Thermal Plant (GHTP) in Lehra Mohabbat have started work-to-rule strike in protest against the suspension of Mr V. Sharma, former Chief Engineer, GHTP, by the PSEB management. In a press note issued today, Mr Arun Arey, regional secretary of the association, alleged the PSEB management had backtracked from its promise made with the central body of the association regarding revoking the suspension at Patiala recently. He expressed apprehension that work-to-rule strike of the engineers could affect the smooth functioning of the first unit of the GHTP which was still under stabilisation. He pointed out that commission of second unit of the thermal plant for commercial generation would also be delayed due to work-to-rule strike. He disclosed that association members would go on mass casual leave. The date in this regard would be fixed by the association shortly. He said engineers were also holding gate rallies every day in the morning. He said the engineers' association also supported the cause of the UPSEB engineers who were on a war path with the UP Government for their demand for better pay scales. KHARAR, July 24  Mrs Neelam Arora, Sub-Divisional Judicial Magistrate, today remanded one Jaspal Singh Dhillon, Chairman Human Rights and Democratic Forum, who was arrested by the Sohana police in connection with a case registered on June 13, 1998, about the conspiracy to free Jagtar Singh Hawara, a terrorist from Burail Jail, was remanded in police custody till July 27. Mr K.S Brar, Asstt Public Prosecuter, appeared on behalf of the state and informed the court that some arms were yet to be recovered as per information given by accused and information was yet to be collected about the money which came through hawala transactions from the accused. Three other accused of the same case were still abroad. The police was yet to know their whereabouts from the accused. AMRITSAR, July 24  Dal Khalsa International has criticised the role of the Batala police as it allegedly harassed organisation spokesman Kanwar Pal Singh at the Batala sadar police station yesterday. After his release, Mr Kanwar Pal Singh in his statement said he was arrested by SHO Jarnail Singh from the Dabnwala village, 14 km from Batala, where he and his friends had gone to visit another friend, Gurmej Singh. "The SHO took away three of us to the police station and after questioning us locked us in a room. Without giving us any reason, he asked us to remain inside for the whole day. We were not allowed to contact our lawyer and family members," he said. When asked on what grounds they had been arrested, he alleged the SHO became abusive. Late at night, Mr Kanwar Pal Singh said he and the others were questioned by SP (Operations) Vivek Mishra, who after conducting his investigation released them. Meanwhile, Mr Lok Nath Angra, district police chief, Batala, has claimed Mr Kanwar Pal Singh was let off after preliminary investigations. Talking to TNS on telephone, Mr Angra said he was released in the presence of panchayat members when he disclosed his identity. He further said the Dal Khalsa spokesman was rounded up for questioning when he was sitting in the house of a dismissed constable, who was allegedly involved in militant activities. However, no case was registered, he claimed. Meanwhile, Mr Kirpal Singh Randhawa, deputy chairman of the Punjab Human Rights Commission, in a press note, has condemned the role of the police. CHANDIGARH, July 24  The Punjab Forest and Wildlife Preservation Minister, Master Mohan Lal, today stressed the need for protecting flora and fauna and for conserving the environment. He was addressing a largely attended gathering in Kandhu Khera village in connection with awareness campaign launched by the All India Jeev Raksha Bishnoi Sabha, Abohar. He announced the institution of a memorial award in the name of late Amrita Behniwal who laid down her life for the protection of a tree. This award will be presented on August 15 and January 26 to those who have made outstanding contributions towards wildlife protection. He also favoured introduction of a subject on environmental studies for degree classes and said a meeting of Vice-chancellors of state universities would be called shortly. Appreciating the work done by the Bishnoi Samaj, he said a statue of the late Sant Kumar Bishnoi in the Abohar wildlife sanctuary would be installed this year. He further declared to invite new President of All India Jeev Raksha Bishnoi Sabha as special invitee to the meeting of State Wildlife Advisory Board, Punjab. Mr Gurdas Singh Badal was also present at the conference. The Chief Wildlife Warden said Punjab had 316.130, sq km of area under protected area network and efforts were being made to increase this area for biodiversity conservation. FEROZEPORE, July 24  There was no proposal to terminate Jammu Tawi-bound trains at Pathankot railway station in view of recent bomb blast on the Shalimar Express. This was stated here today by the Divisional Railway Manager (Northern), Ferozepore, Mr N.K. Goyal. He was addressing a press conference at his office. He said a news item stating that the Railways was planning to terminate the Jammu Tawi-bound passenger trains at Pathankot in view of the explosion on the Shalimar Express and terrorists activities in Jammu and Kashmir was totally false and baseless. Mr Goyal said, "We are trying to find those Railway sources which gave this wrong information to the Press". Pakistan wanted to interrupt the train services, but it would not succeed in its goals, he added. The DRM said an action plan had been prepared to ensure protection of property of the Railways, including rail tracks. He said the accused responsible for the explosion on the Shalimar Express had been arrested and hoped they would further disclose clues about the incident. Regarding development works undertaken in the division, he said seven railway stations  Jammu Tawi, Pathankot, Jalandhar, Ludhiana, Ferozepore, Beas and Amritsar  had been chosen for overall development, which includes the work of beautification. ROPAR: In memory of jawans who laid down their lives, a war memorial is being constructed at Maharaja Ranjit Singh Bagh, situated near here, on the left bank of the Sutlej. The 55-foot-high memorial is expected to be completed at a cost of Rs 15 lakh by the end of this year. The memorial is being designed by Mr P.R. Luthra, Punjab's Chief Architect, and is being built by the PWD (B&R) Provincial Division, SAS Nagar. The administration has so far provided funds worth Rs 7 lakh through the District Planning and Development Board, Ropar, for the project, while a grant of Rs 5 lakh was announced for the memorial by Punjab Finance Minister Kanwaljit Singh on April 24 last when he laid the foundation stone of the memorial. Another grant of Rs 50,000 for the memorial was announced by Mr Madan Mohan Mittal, Food and Supplies Minister. The grants, announced by the two ministers are still awaited. According to Capt Rajdeep Singh Kamboj, Deputy Director, District Sainik Welfare Office, here, after the completion of this war memorial, it will be the first of its kind in the state since 1947. A Punjab War Memorial already exists at Jalandhar, but the Ropar memorial would be unique one, he added. The district has a total of 88 war martyrs who laid down their lives in the 1962, 1965 and 1971 wars, besides the IPKF operations in Sri Lanka and Operation Meghdoot in J&K. The war memorial will have 12 arches, a 35 ft high pillar, a long flame and platform. The flame would be lighted in saffron shade to symbolise sacrifice while 12 arches will indicate 12 Sikh Misals which were conquered by Maharaja Ranjit Singh to establish a strong regime. A brief history of each misal would be written on each arch. It may be mentioned here that earlier the war memorial was set up at the Sainik Rest House here, but in view of the proposed widening of the road, it was shifted to Maharaja Ranjit Singh Bagh. The setting up of the war memorial in the Maharaja Ranjit Singh Bagh will attract more visitors.